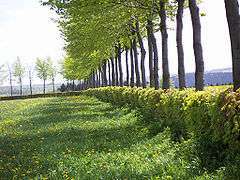 A hedge or hedgerow is a line of closely spaced shrubs and tree species, planted and trained to form a barrier or to mark the boundary of an area, such as between neighbouring properties where mature, Instant Hedges are used. Hedges used to separate a road from adjoining fields or one field from another, and of sufficient age to incorporate larger trees, are known as hedgerows. When clipped and maintained, hedges are also a simple form of topiary. A typical old Scottish march dyke, but without boundary trees. 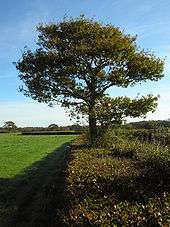 Hedgerow trees are trees that grow in hedgerows but have been allowed to reach their full height and width. There are thought to be around 1.8 million hedgerow trees in Britain (counting only those whose canopies do not touch others) with perhaps 98% of these being in England and Wales. Hedgerow trees are both an important part of the English landscape and are valuable habitats for wildlife. Many hedgerow trees are veteran trees and therefore of great wildlife interest. Historically, hedges were used as a source of firewood, and for providing shelter from wind, rain and sun for crops, farm animals and people. Today, mature hedges uses include screening unsightly developments. An alternative to hedge laying is trimming using a tractor-mounted flail cutter or circular saw, or a hedge trimmer. The height of the cutting can be increased a little every year. Trimming a hedge helps to promote bushy growth. If a flail cutter is used, then the flail must be kept sharp to ensure that the cutting is effective on the hedge. The disadvantage of this is that the hedge species takes a number of years before it will flower again and subsequently bear fruit for wildlife and people. If the hedge is trimmed repeatedly at the same height, a 'hard knuckle' will start to form at that height – similar to the shape of a pollarded tree. Hedges that have existed for hundreds of years are colonised by additional species. This may be useful to determine the age of the hedge. Hooper's rule based on ecological data obtained from hedges of known age suggests that the age of the hedge is equal to the number of woody species counted in a thirty-yard distance multiplied by 110 years. Hedges trimmed in a California lawn. 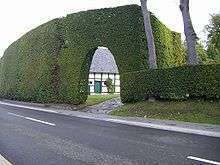 In the US, some local jurisdictions may strictly regulate the placement or height of a hedge, such as the case where a Palo Alto city resident allowed her xylosma hedge to grow above two feet and was arrested for it. An example of an instant hedge can been seen at the Elveden Hall Estate in East Anglia, where fields of hedges can be seen growing in cultivated rows, since 1998. 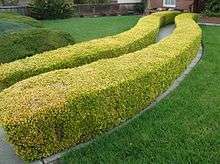 The development of this type of mature hedge has led to such products being specified by landscape architects, garden designers, property developers, insurance companies, sports clubs, schools and local councils, as well as many private home owners. Demand has also increased from planning authorities in specifying to developers that mature hedges are planted rather than just whips (a slender, unbranched shoot or plant). "Quickset" redirects here. For the lock manufacturer, see Kwikset. A Devon hedge is an earth bank topped with shrubs. The bank may be faced with turf or faced with stone. If stone-faced, the stones are generally placed on edge, though around gateways the stones are often placed flat. The Willow Palisade, constructed during the early Qing Dynasty (seventeenth century) to control people movement and to collect taxes on ginseng and timber in southern Manchuria, also had hedge-like features. The palisade included two dikes and a moat between them, the dikes topped by rows of willow trees, tied to one another with their branches. Gradually decaying throughout the late eighteenth and nineteenth centuries, the palisade disappeared in the early twentieth century, its remaining willows cut during the Russo-Japanese War of 1904-05 by the two countries' soldiers. ↑ The Tree Council (2008). Hedgerow Planting: Answers to 18 Common Questions. Natural England. ISBN 978-1-84754-051-5. ↑ Blumenson, Martin (1993). Breakout and Pursuit. Washington D.C.: Center of Military History. p. 11. 1 2 3 4 5 6 7 The Tree Council (2008). Hedgerow trees: answers to 18 common questions. Natural England. ISBN 978-1-84754-051-5. Retrieved 2009-08-06. ↑ Alan Brooks and Elizabeth Agate (1998). "The Hedgerow Landscape : Hedgerow Dating". Hedging. BCTV. ISBN 0-946752-17-6. Retrieved 2009-08-06. ↑ "Statutory Instrument 1997 No. 1160". The Hedgerows Regulations 1997. OPSI. Retrieved 2009-08-06. ↑ "When Law Goes Out on a Limb". The Heritage Foundation. ↑ Cherry, Stefan D.; Erick C.M. Fernandes (1998). "Live Fences". Cornell University. Retrieved 2007-07-01. ↑ "Hedges - Elveden Estate". Elveden Estate. Retrieved 2015-12-09. 1 2 The Devon Hedge on the Devon County Council website. ↑ Rooney, Debs. "A Walk in the Country". Children's Green Detective Guide to Cornwall. Agenda 21 Publishing Ltd. ISBN 0-9543925-0-7. ↑ "New course will try to save traditional Cornish Skill". The West Briton Falmouth edition. 2007-05-10. p. 24. ↑ Edmonds, Richard Louis (1985). 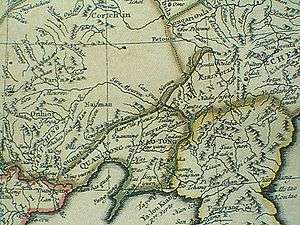 Northern Frontiers of Qing China and Tokugawa Japan: A Comparative Study of Frontier Policy. University of Chicago, Department of Geography; Research Paper No. 213. pp. 56–57. ISBN 0-89065-118-3.